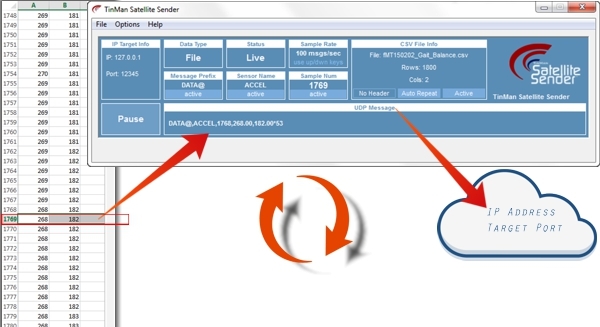 Satellite Sender is a lightweight, fast and efficient workhorse utility for assembling and sending UDP messages to a target IP address and port at various sample rates. It can be used to read data directly from CSV files or send random cyclic data as target systems are being tested. Satellite Sender functions as a "virtual sensor", re-transmitting logged sensor data via the Internet, anywhere to anywhere, at almost any speed. 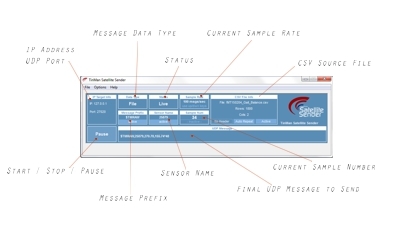 It 'sits on' CSV (comma-separated) data files to read and send each row of data as a custom packaged UDP message at up to 400 samples (rows) per second to any IP address and port - for processing, analysis and or building decision making systems. Configure as many instances of Sender with as many source files as desired. 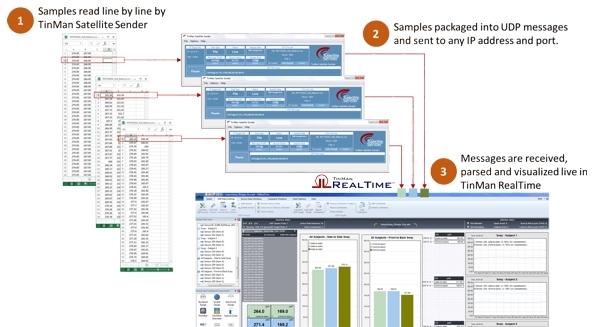 Point the target IP address and Port to the PC with TinMan RealTime and receive, fuse and visualize with any set of cusomizeable gauges and charts..
Use Sender to send line by line data directly to AI Builder system inputs to for running simulations with logged sensor data. This is helpful for repeating sets of circumstances that need to be perfectly responded to by the AI system in testing. Take Sender for a free spin. Download a 30-day trial. If you are viewing from a mobile device - no problem - we will send a download link to your email. While just a utility, the Satellite Sender is a powerful workhorse that has great flexibility in reading, structuring and sending UDP messages to a target port and IP address destination. 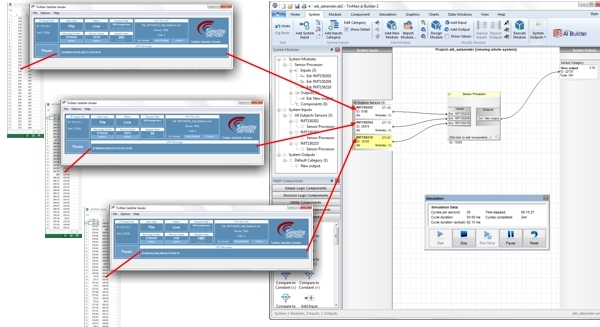 Informative live interface allows single click edit access and constant update. Easily configure and modify messages as they are being sent to assess target application responsiveness.